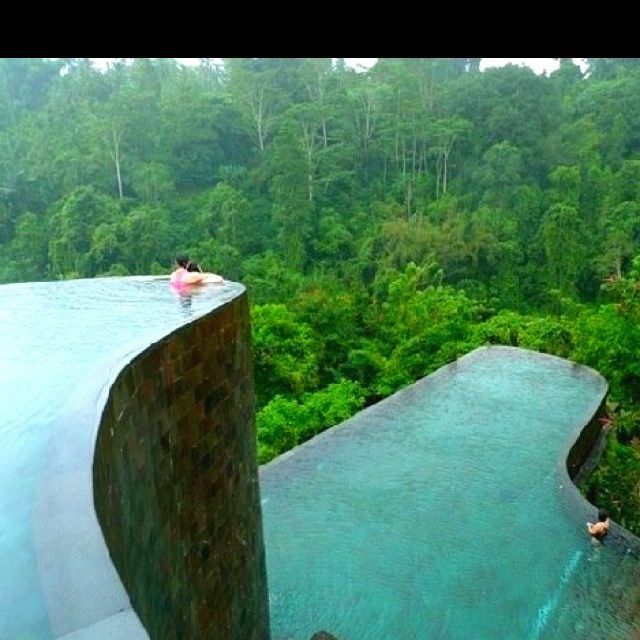 One of the most amazing infinity pools in the world reside at this luxury vacation spot. Nestled deep in the heart of Ubud’s rich rainforest preserve, this enchanting five star boutique hotel, designed in complete harmony with nature, has 38 private suites and individual villas, each enhanced by its own luxurious heated granite infinity pool, rippling into the jungle below. The hotel, with its stunning and much-lauded twin-level cascading pools, overlooks lush jungle landscapes where monkeys chatter in the coconut palms and the fast-flowing Ayung River courses over splendid waterfalls, while facing an ancient Hindu temple across the spectacular plunging gorge. The hotel’s renowned Beduur Restaurant serves innovative dishes with Asian, Western and Mediterranean influences, using local herbs and spices grown in the neighboring village and freshly-caught fish from Jimbaran Bay. A funicular gently glides through the canopied jungle to the terraced levels of the property. The verdant gardens incorporate indigenous flora and fauna such as cocoa and coffee trees, which blend serenely with bamboo, flame trees and orchids to create a unique tropical paradise. The truly luxurious Ayung Spa combines natural local ingredients and ancient techniques, to create beauty therapies and treatments that soothe the mind, rejuvenate the body and energise the soul. We employ many of our gracious staff from the local village, which the hotel takes great care to support with programs such as a planned new library for the village school, which guests are invited to contribute books to. The owners also take great pride in the hotel’s level of sustainability, using local craftsmen, produce and materials wherever possible. For guests wishing to experience authentic Balinese hospitality, rich cultural heritage and indulgent luxury, Hanging Gardens Ubud is perhaps the most enchanting and rewarding paradise on earth. If you know of a really cool pool send us a pic or post it on our Facebook Page. I don’t know of a cool pool, I just wanted to pass along a message of a couple spelling errors in the last line before the comments.’You’ is spelled wrong as well as ‘pic’ for picture.